While perusing Elements of Style a few weeks ago, I came across a post on Marigot pajamas. I clicked on the link and within minutes found myself adding this pair of pink and mint PJ’s to my cart. 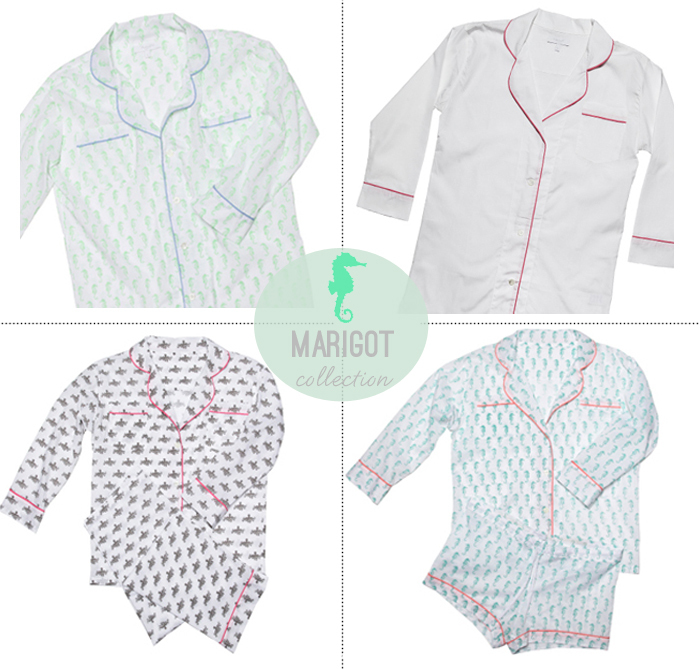 I’ve never been able to resist a pair of crisp, cotton pajamas – and Marigot’s certainly don’t disappoint! They have several different styles (I thought the shorts set would be perfect for warm summer nights), and there’s plenty of fun colors and prints to choose from. And, of course, they’re super comfortable! They might just be the perfect PJ. Prettiest pajamas ever! Thanks for sharing, Bradley! I just love these! I wanted a set during the winter months but never pulled the trigger because I was afraid of getting hot while I sleep. These shorts versions might be that answer I was looking for! Those do look comfy and cute.Perfect for a good night sleep and lounging. oh, i love these. need a pair. i love the mint colored ones. perfect summer jammies. It would be awesome if you could offer some P.J. 's like the ones in the bottom right hand corner for a little cheaper price. Have you seen any around?